Chandra' s observation in March of 2001 of the neutron star KS 1731-260 (pale blue dot just above the middle of the image) showed that it is a remarkably 'cool' 3 million degrees Celsius. 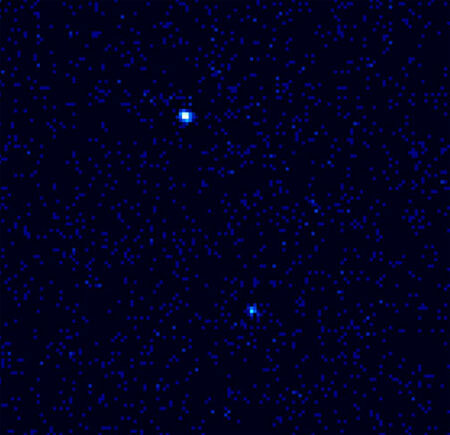 This low temperature was surprising because in the period 1988 to 2000 the neutron star was shining brightly in X-rays due to the heavy bombardment of gas from a companion star, not visible here. 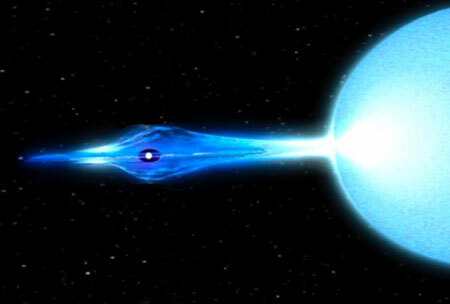 A neutron star temperature of 10 million degrees or more was expected. A possible explanation for the relatively low temperature of KS 1731-260 in its present quiet state is that it was in a deep freeze for a thousand years before 1988 and took 12 years of heating just to get to the temperature it is today. If so, it may represent a new type of neutron star system that stops accreting gas for a long period of time, and there could be hundreds of undetected, cold neutron stars in our Galaxy. Coordinates (J2000) RA 17h 34m 13.5s | Dec -26° 05´ 16.8"